It seems almost quirky — carrying your own egg to a hawker stall, and asking the uncle to whip you some char kway teow with it. But that’s what Singaporeans did in the past. And over National Day, a hawker revived the practice at his stall. 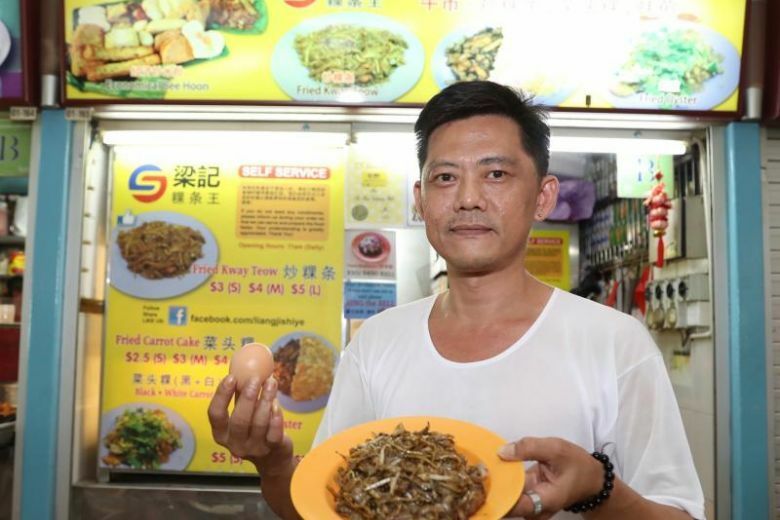 Mr Dominic Neo, owner of Liang Ji Kway Teow King, wanted to let the younger generation experience how char kway teow was ordered in the past. In celebebration of National Day, he dangled a juicy carrot — bring your own raw egg to his stall, and he’ll whip up a plate of noodles for you just for 50 cents. As expected, the older generation got nostalgic, with a 61-year-old auntie reminiscing about how the char kway teow stall near her house used to sell noodles for 50 cents. She recalled that indeed, if customers brought their own eggs, they could get a 10 to 20 cent discount. 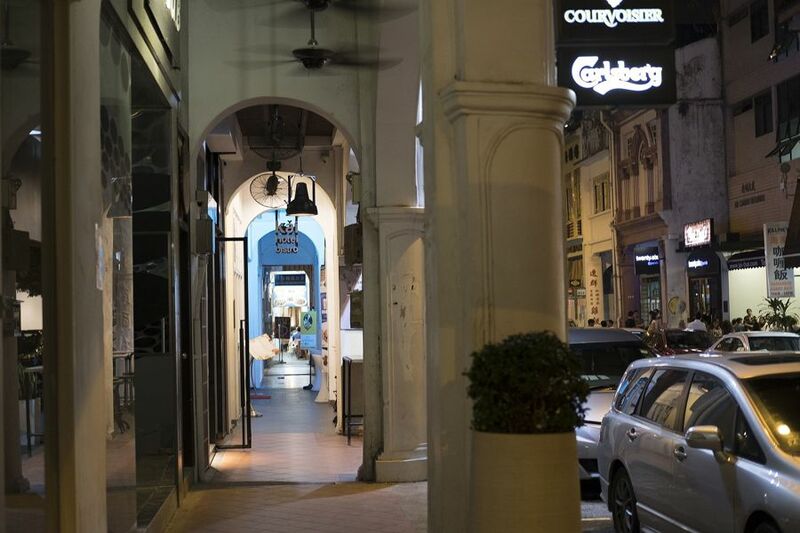 Mr Neo’s effort also shed light on the evolution of the cherished dish in Singapore. 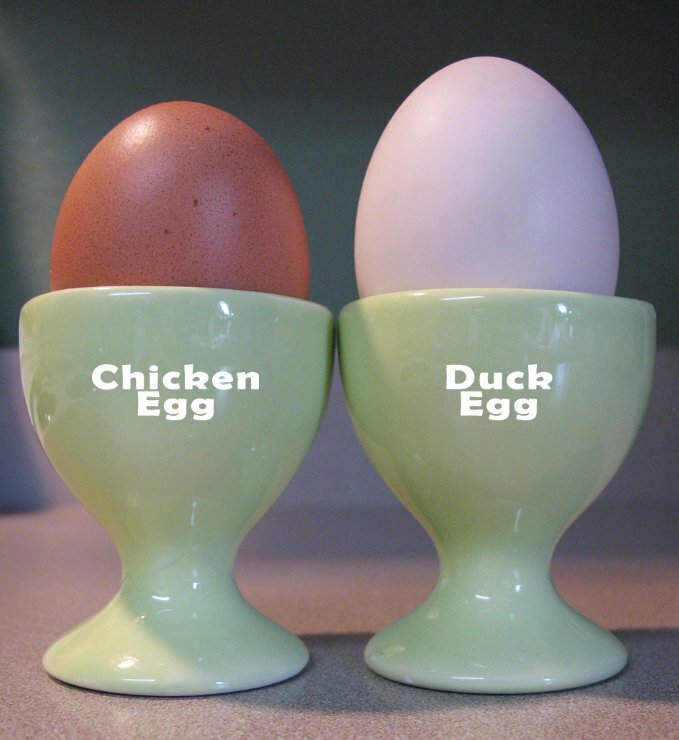 For instance, did you know that it wasn’t always tiny chicken eggs that were used? In ’60s and ’70s, duck eggs were used to make a much richer char kway teow. But a ban on duck eggs from countries affected by bird flu and the closure of duck farms in Singapore mean that we have to go elsewhere for our duck egg char kway teow fix. Having customers bring their own eggs to char kway teow stalls isn’t the only obsolete hawker practice. 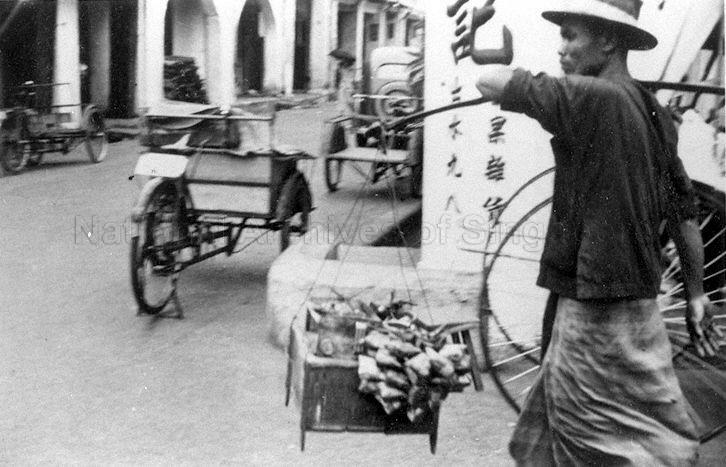 Here are 4 more interesting things hawkers used to do in the past. 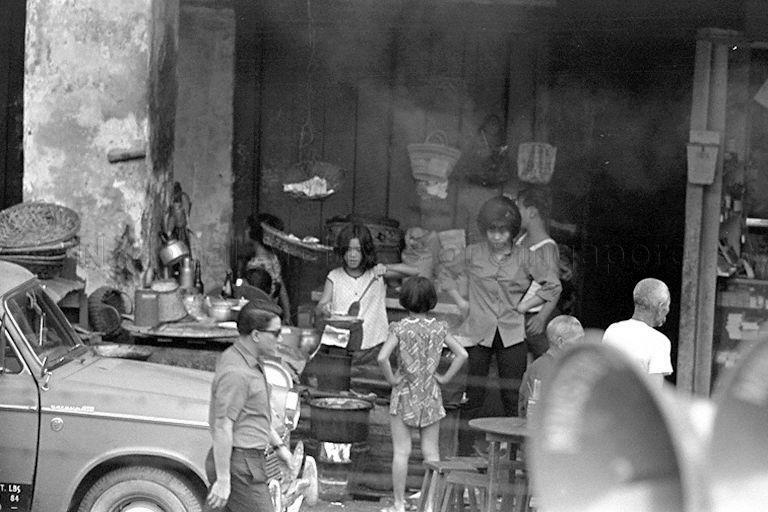 They might have been culinary practices but they give us insights into how Singaporeans of yesterday used to live, work and play. While we are more used to hawker centres, our grandparents would be more familiar with the mobile hawkers. They emerged in the mid-19th century, peddling their wares from door to door. We don’t see so much of them now, but traces of them still exist, especially in the form of ice cream vendors and roadside cobblers. Back then, they provided most of what the working class needed. From peddling tea cups to needles, barbering to knife-sharpening, to providing convenient access to affordable food — the pushcart hawker did it all. Even bomohs, or traditional medicine men, operated street stalls. It was a popular trade among many new immigrants because little training was needed and the start-up costs were low. But hawking was haphazard and associated with many problems including food contamination, traffic obstruction and exploitation by secret societies. So in 1915, the colonial government passed laws to license street hawkers. Yet, even in the 1930s, approximately 4,000 out of the 10,000 street hawkers did not have a licence. 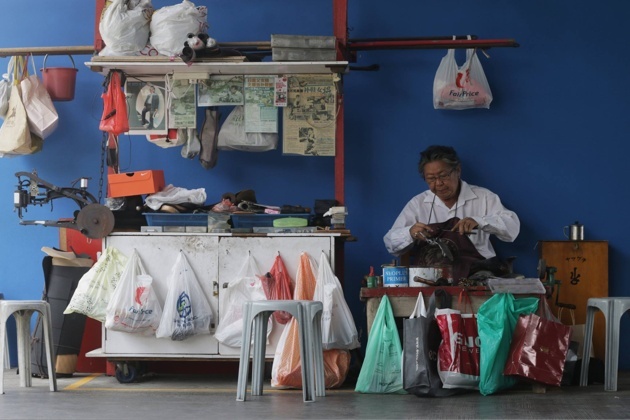 It was only from the 1960s to the 1980s when the government stepped up enforcement against unlicensed hawkers and constructed more hawker centres and markets that the problems arising from the trade decreased. 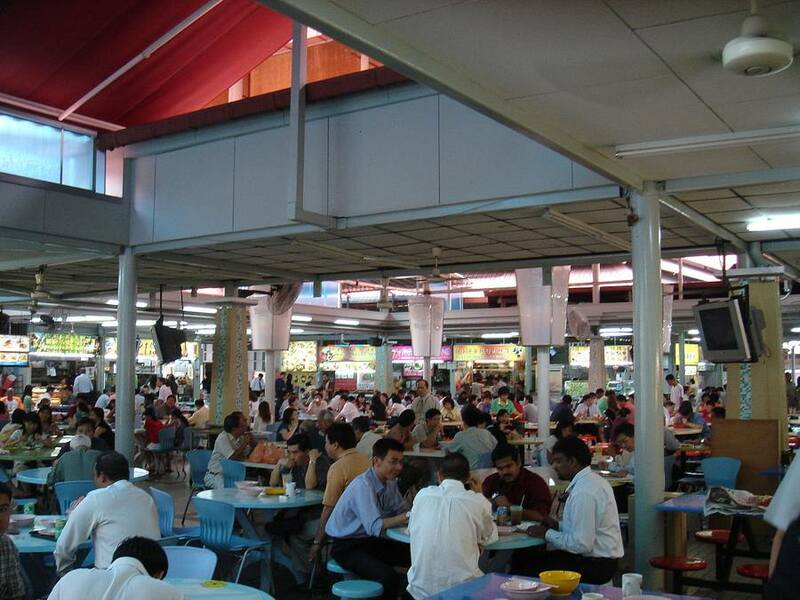 The efforts saw the decrease in itinerant hawkers, and the rise of the now ubiquitous hawker centre. Most Singaporeans would pull a face if asked to dip their satay into communal sauce pots today. 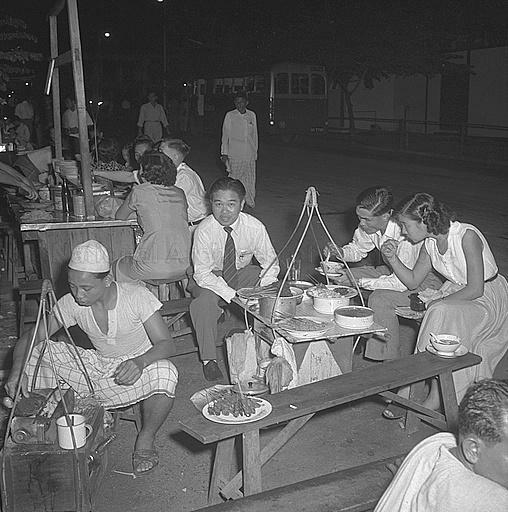 But drenching satay in shared peanut gravy at roadside stalls was a common practice in the past. Blockage of roads and cases of dishonesty by illegal hawkers meant to that authorities had to take action. They set up the Hawkers Department to deal with all hawker-related matters. But according to a former employee of the Department, some illegal hawkers were “very enterprising”. They discreetly paid shopkeepers along “five foot ways” a “rent” to set up stalls in front of the shops. Five foot ways are sheltered walkways originally 5 feet in width. They were devised by Stamford Raffles, who wanted to protect pedestrians from the rain and the sweltering hot sun. 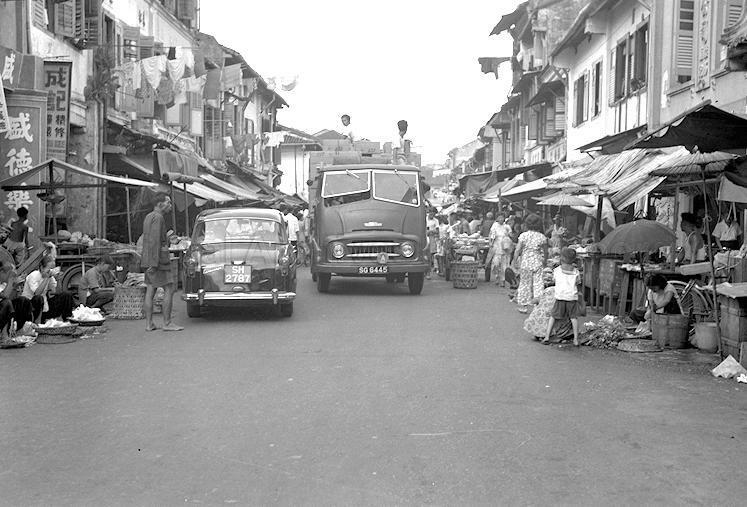 When hawker inspectors came, the shopkeepers would claim that the stalls belonged to them, thereby helping the illegal hawkers to avoid trouble. This was a headache for the Hawkers Department, which came up with a solution. It decided to undertake combined raids with the Weights and Measures Department. Since many of the weighing scales were found to have been tampered with, hawker inspectors often could summon the shopkeeper and accuse him of an offence. Then, the shopkeeper would admit that the illegal stall did not belong to them. 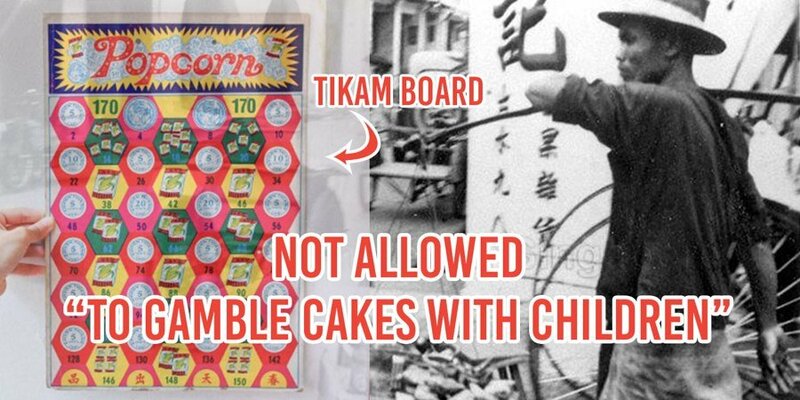 The Tikam Tikam man was the uncle who operated the Tikam Tikam (“game of chance”) board, a popular children’s “gambling game”. 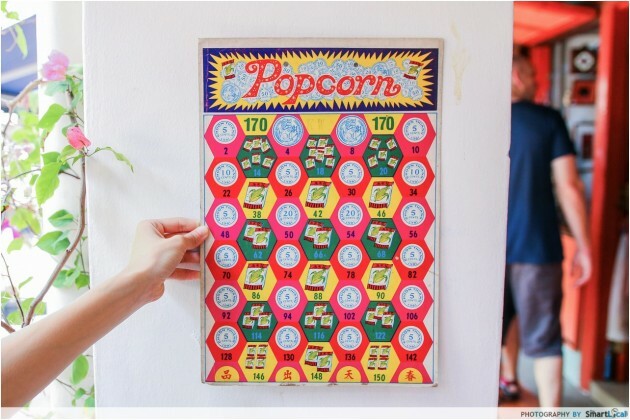 Hawkers liked to display these boards near schools to attract children to play the game. Players would pay a small sum to pick a ticket from the board. 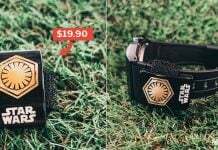 Depending on their luck, they could get a small snack, or something as great as a pack of trading cards. Unfortunately, from the 1950s to the 1970s, these hawkers were portrayed as the “nefarious figure of a swindler preying on children”, who caused them to lose their pocket money by engaging in gambling activities. Efforts to rid the “gambling stall racketeers” around schools included waves of police action. Hence, the demise of the lively game with hawkers. Apparently something similar was reported in The Straits Times way, way back, on 28 July 1898. 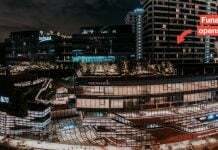 It said that a hawker was “fined with two dollars, or three days, for gambling with cakes with children”. Guess our obsessions never cease. 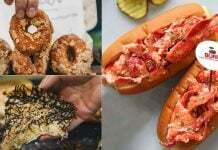 Despite the setbacks and challenges faced by hawkers, it is clear that their dogged determination has helped them to successfully adapt to our changing environment. 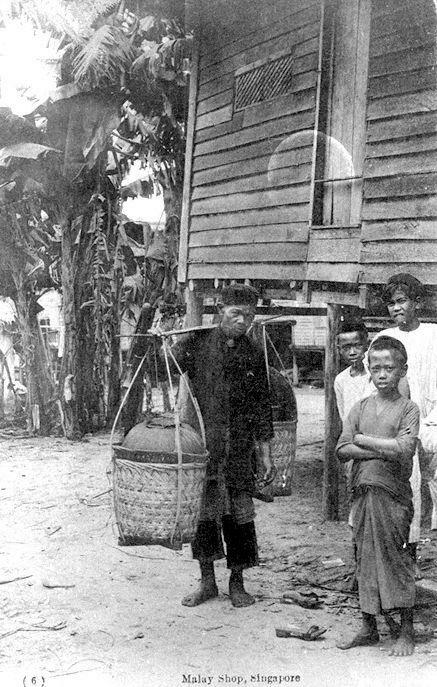 Featured image from The Smart Local and National Archives of Singapore.